Because you can never have too many swans in your life, DENNATON and Erick Scarecrow of Esc-Toy Ltd are teaming up once more to Kickstart the next action-figure offerings in the Hotline Miami universe. Twinsies Alex and Ash are the latest to receive the Kickstarter Treatment, which just went live within the last hour. The fund goal is $75,000 and if met, the murderous birds (murder of swans?) will go into production. 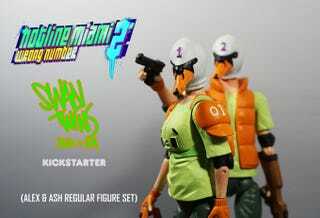 The pair will go for a starting price of $80 ($70 for early birds), which comes with a normal colour scheme as represented in Hotline Miami 2: Wrong Number, accessories of a chainsaw, handgun, shotgun, uzi and a slice of pizza (I bet that pizza is good but what do I know about such things); as well as a poster and pins. After that, higher tiers will net special colourways as with previous Kickstarter figures in the series, like SOAKED.